The pancreas is a compound, acinar, serous , exocrine gland with islets of endocrine cells. 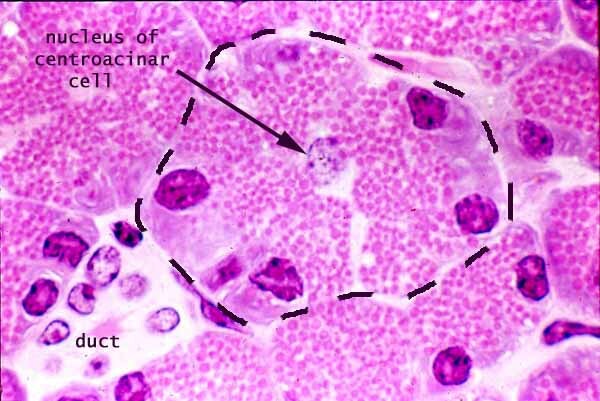 One single acinus , composed of several serous cells, is outlined in the center of the image. The dotted outline follows the basement membrane of the acinus, upon which the base of each secretory epithelial cell rests. The apical ends of these epithelial cells is exposed to the tiny lumen at the center of the acinus, which communicates through the duct tree into the intestine. At the center of this acinus is the centroacinar cell, the initial cell of the intercalated duct which drains the acinus. 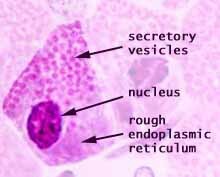 Note: Although each secretory acinus is each enveloped by a thin layer of connective tissue and a network of capillaries, this delicate stromal support is rarely evident in prepared specimens.